Your company’s website must be compatible with smartphones and mobile devices which are used more and more by your potential customers. Your website will be the first stop for customers in the research phase of the buying process so everything from the online product catalog, customer service, product details and advantages, customer testimonials, company history, etc. must be easily accessible. Search Marketing is a constant task. Search Engine Optimization (SEO), Pay-Per-Click and Retargeting are vital for the survival of your business online. They all involve the process of gaining website traffic through various means. SEO: the process of increasing website visibility through organic, unpaid and earned search engine results. Pay-Per-Click: drives traffic to website through paid ads where a small fee is paid every time an ad is clicked. Retargeting: online advertisements are displayed to targeted consumers based on their previous relevant internet activity. To keep up with the rest of the world on the Internet, your search marketing needs to be a constant part of your strategy. These are perfect for manufacturers. Both trade magazine websites and e-newsletters are great tools to reach buyers in a specific industry and/or trade. The people subscribing and interacting with these online resources are those who are genuinely interested in this type of information. Social Media is excellent when it comes to lead nurturing. Connecting with potential customers online is easy and with just a few clicks of a ‘like’ button and a comment here and there, you are on your way to building those necessary relationships that ultimately generate potential leads. Tip: LinkedIn is the main platform you want to utilize. More often than not, you are able to obtain the contact information of potential buyers there. While digital seems to be the way to go in today’s world of marketing, believe it or not print advertising still plays a strong role among B2B marketers. Let’s take a look at some of the benefits of modern-day print advertising and how you can incorporate it into your strategy. Brochures, catalogs, newsletters, mailers, postcards, thank you notes, etc. These materials tend to be longer-lasting than online ads, which are sent to one individual and then are deleted. There’s also something about ‘the written word’ that establishes trust between the customer and a company. It’s permanent, and can make an immediate and lasting impression. Manufacturing companies have the potential to reach a highly targeted and focused audience with print ads. Audited magazine readership ensures readers are genuinely interested and have willingly subscribed to that publication. And because there are not as many print ads as before the days of digital options, there is less competition for your ads. 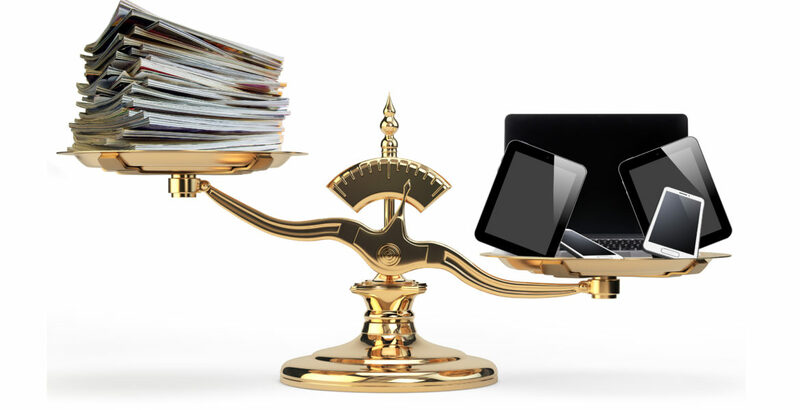 Conclusion: So, what’s the right balance between digital & print advertising for you? As a rule of thumb for manufacturing advertisers, we typically suggest allocating 25% – 35% of your budget to print to start, and the remaining portion properly divided among digital options. The bottom line is that it truly depends on what industry you are in, the audience you are targeting, your overall budget, and several other factors. We recommend analyzing each one of these factors individually, as well as measuring your past success and adjusting what you need to do for the future. Working with an agency who has the right experience can be extremely beneficial, and can save you time and resources while producing better results. So, what are you waiting for? Give us a call. We’ll get you started on the road to success.